Translated by Constance Garnett, translation revision by Bernard Guilbert Guerney, and the three omitted chapters translated, edited and revised by Gustavus Spett. Introduction by Lionel Trilling. 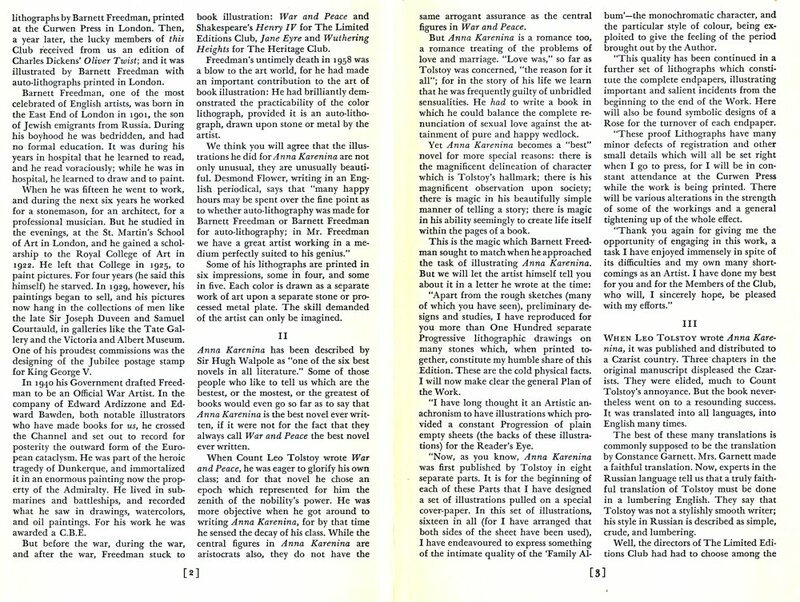 Reprint of LEC #213, 20th Series, V. 5 in 1951. Originally 2 volumes. I have Resurrection and the exclusive War and Peace Heritage editions, so you can expect those down the road. Production details! The LEC’s text was set by the Cambridge University Press, which the Heritage reproduces. Brooke Crutchley oversaw the LEC edition’s production, following the typographic plans of John Dreyfus. I cannot tell if Cambridge actually printed out the Heritage reprint’s pages from the Sandglass. 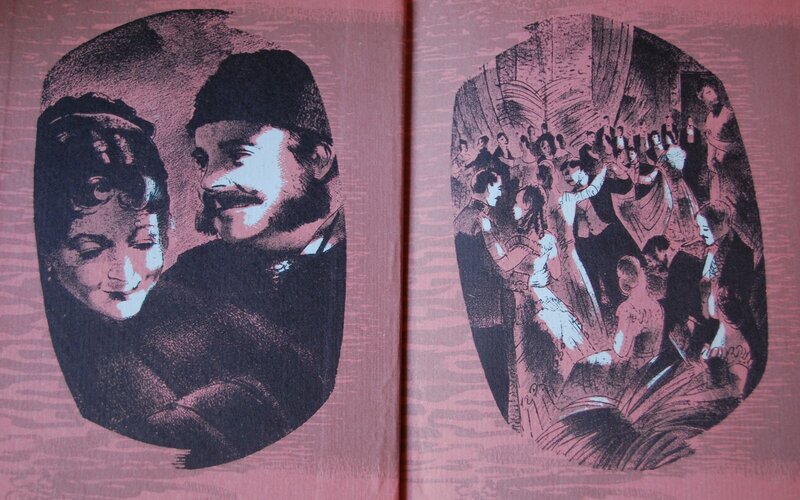 The Curwen Press of London however did redo Freedman’s lithographic prints. Russell-Rutter and William Fortney once again did the bindery honors. The font is Ehrhardt, with the larger letter-shapes being of the Fleischmann type. Back Boards – A delightful rarity to have art on both sides! The Bronte books share this feature as well. Title Page – A lot of hands were involved in this book. 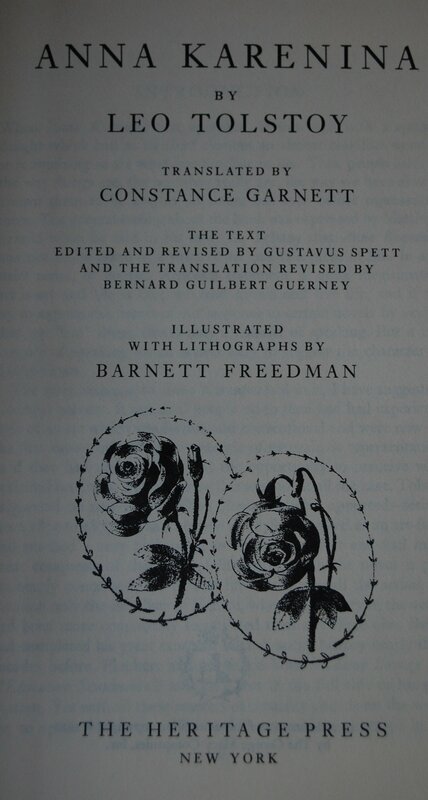 Constance Garnett’s translation was chosen as the best choice for this work, but two further assistants were added to further refine her work. The first is Gustavus Spett. He is a Russian expert and translated three chapters Garnett did not originally. The second is Bernard Guilbert Guerney, who edited and revised Garnett’s work. Although he is not mentioned here, Lionel Trilling supplies an introduction. Front Endpapers – This is a massively illustrated work, that it is. 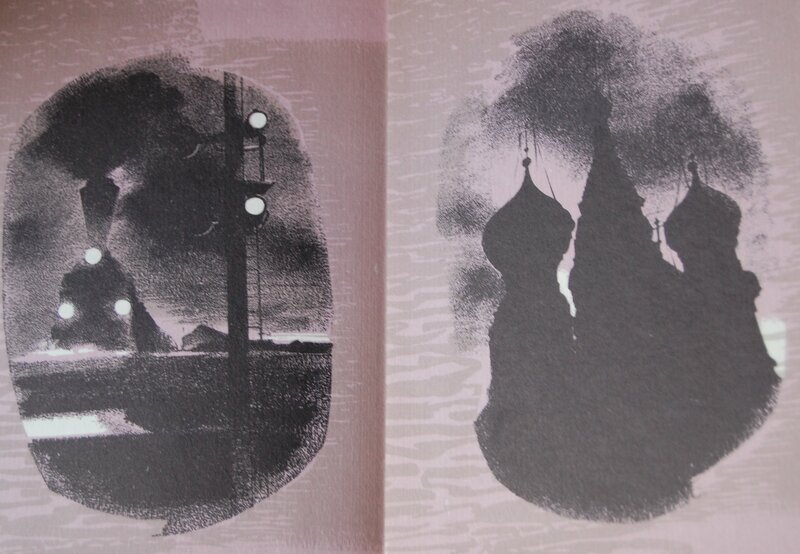 I figured I’d give you more bang for your buck and include the endpapers over interior illustrations. Each color was its own stone in the lithographic process, so just imagine how much foresight and planning had to go into each illustration! Personal Notes – This came with my huge library acquisition. I’m glad to have it, as I’ve been curious about the contents of the novel for some time. * = The Sandglass specifically mentioned Freedman’s death in 1958, so this is clearly not the original publication date for my copy. I will respectfully keep the date as is due to the book stating it as such, but I wanted to let you know that this is not a 1952 printing. I am a Freedman fan, and have all his work for the LEC and the Heritage Press–including this volume from both companies. Macy always felt that Freedman’s War & Peace was one of the ten greatest illustration jobs of all time, and I’m not going to refute that, but I have to say I find this Anna to be an even more masterful job. In it he has chosen a more photographic style than in the earlier works and though I do not always prefer that style over a more stylized depiction, in this novel it couldn’t be a better choice–or better realized. 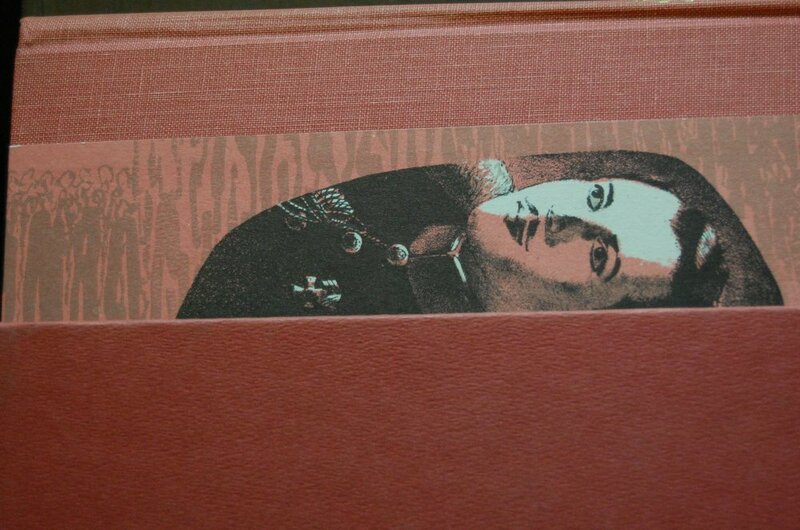 Incidentally, this is one of those cases where the quality of the Heritage Press edition need in no way hang its head in comparison to the pricier LEC version. I just completed the quartet of LEC Tolstoy with the acquisition of the six-volume War and Peace. I never thought I would find a copy in Fine condition with no sunning or rubbing to the somewhat delicate cloth spines, but when one came up on ebay I jumped at it. 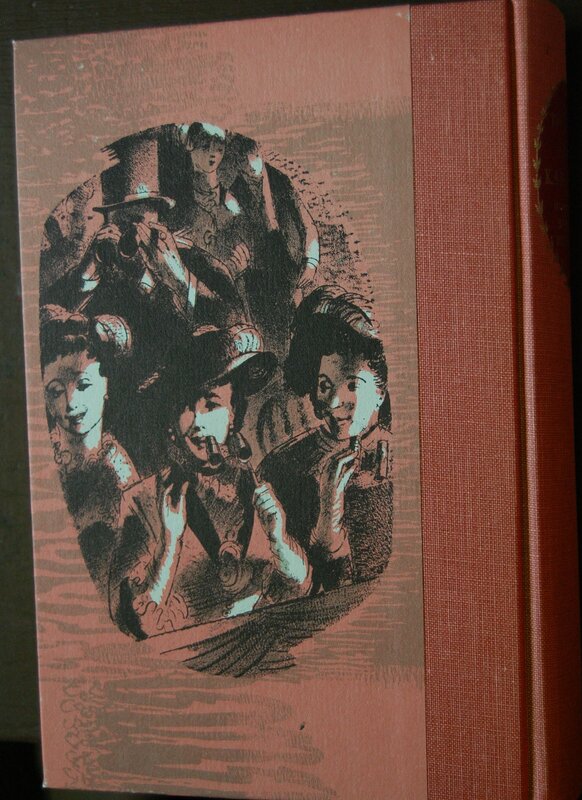 I would like to get the Russian-printed Anna Karenina to round out all the LEC Tolstory editions. I have read Anna Karenina twice and have enjoyed the movies, including the one with Greta Garbo and Frederic March, which I feel can’t be surpassed, but I will watch the new one coming out for coparison. 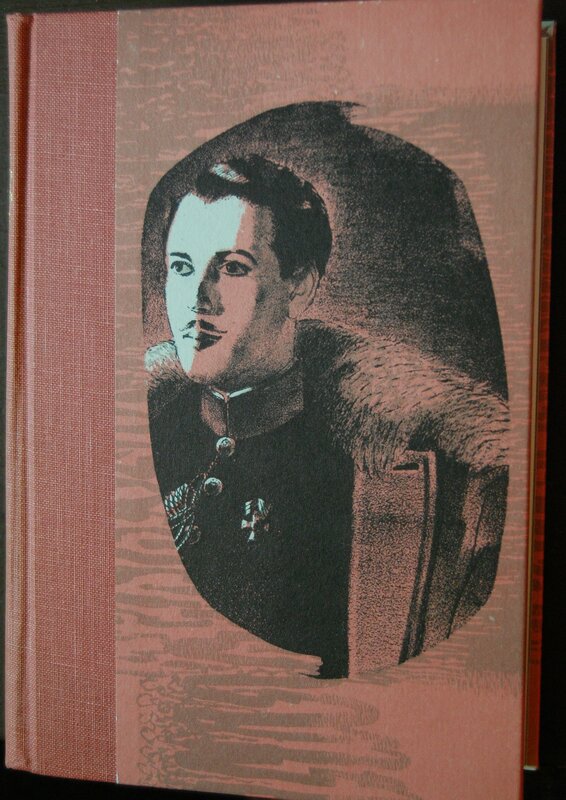 By the way, the portrait of Vronsky on the HP front cover is so like Frederic March in the movie, with the pencil-thin moustache. But it’s never too late to try again and this lovely edition could be the one that tips the balance. So thank you for this post.According to Michael Bussacco’s Heritage Press Catalog and Checklist, your copy appears to be the December 1971 reissue (some Christmas present, eh! ), one of five books in Series 36 published as from the Heritage Club’s Del Mar, California, address. 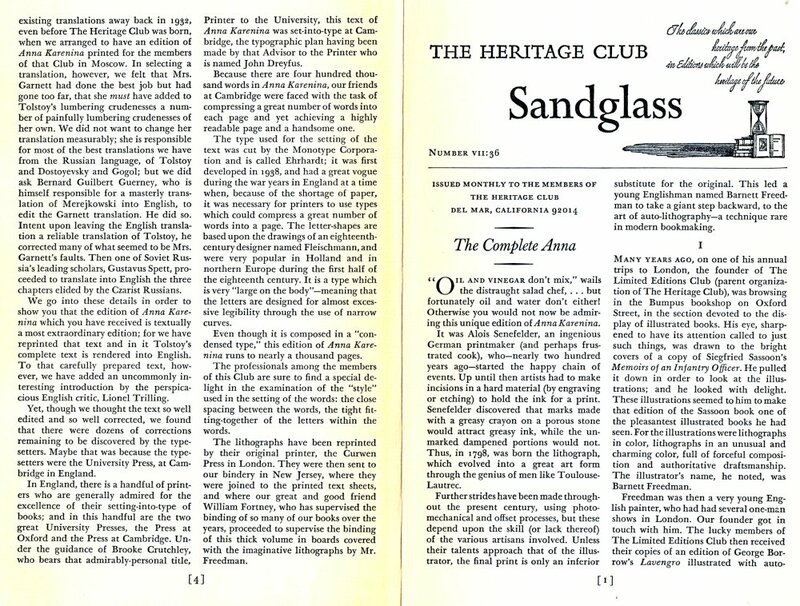 As to where it was printed: both the 1952 and 1971 Sandglasses use the same wording, ie that the lithographs were printed in London and then “sent to our bindery in New York, where they were joined to the printed sheets”. This sounds as if the text was already there, having been printed locally, if not in New York itself, then certainly in the US. The Cambridge University Press had printed as well as bound the LEC edition, which explains how their type-setters became involved; but I guess it would hardly make economic sense to print the much large HP run in England and then have to ship all the sheets back to New York? PS From something leccol says somewhere on the GMD group George Macy had the HP books printed by his own printworks – the Heritage Press! You are currently reading Heritage Press – Anna Karenina by Leo Tolstoy (1952) at The George Macy Imagery.